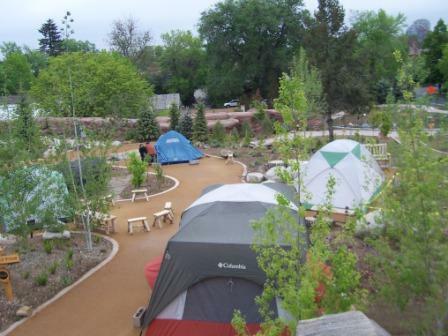 Families are invited to join us for a Cottonwood Campout in the Mordecai Children’s Garden over the Fourth of July weekend. It’s the perfect opportunity for a family to try out camping for the first time or for seasoned campers to escape the crowds in the mountains and leave all of the planning to us. Children of all ages are welcome to attend. Cottonwood Campouts take all the stress and worry out of camping. You supply the tent, sleeping bags and kids, we supply the fun! We’ll help you get your tent set-up next to Springmelt Stream and then fill the evening with fun activities such as Orienteering and Pond Exploration. We’ll even make granola bars for breakfast the next morning. Prior to turning in for the evening, we’ll gather around the campfire to roast s’mores and maybe even sing a campfire song or two. Tired heads will hit the sleeping bag and fall asleep fast. After waking up to the sounds of birds, breakfast will be served and parents can sip coffee while their children play in the garden. Prior to leaving, everyone will plant something to take home. 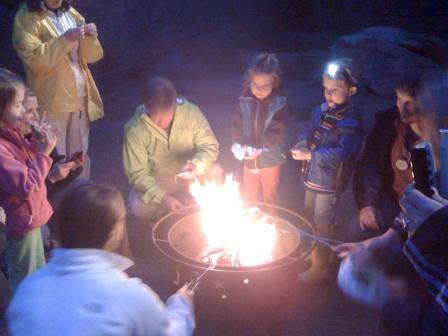 Over Memorial Day weekend, four families joined us for a Cottonwood Campout. For three of the families, this was their first camping experience. The fourth family enjoyed some great mother–son bonding. The kids, ages two to six, loved having the Children’s Garden all to themselves, while the parents smiled as their kids fell in love with camping. 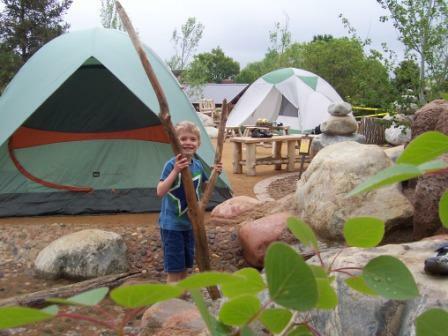 We hope your family will consider joining us for your own Cottonwood Campout experience! When: July 2-3, 5:30 p.m. to 9 a.m.
To register, please complete our registration form and email it to registrar@botanicgardens.org or fax it to 720-865-3685. We’ll contact you once we receive the form to arrange payment and confirm details. While the next Cottonwood Campout is designed for families, we’re also offering Group Campouts on July 16-17 and July 30-31 and a Kids-Only Campout on August 13-14. Group Campouts are the perfect getaway for a Scout group or a group of friends wanting an extra special slumber party!